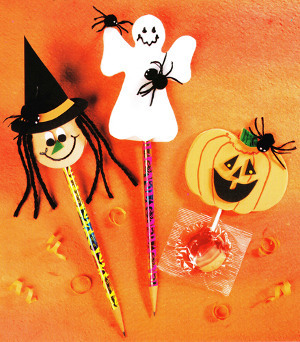 Use craft foam to create a witch, ghost or pumpkin topper for pencils or suckers this Halloween. Kids can help you create these fun tops designed by Heidi Borchers of Inspired at Home to hand out to trick-or-treaters. For more great Halloween Crafts for Kids, be sure to read our Top 20 Halloween Crafts for Kids article! For witch, transfer patterns to craft foam and cut 1 hat, 1 brim, and 2 pupils from black, 1 hatband from orange, 2 witch eyes from white and 1 witch nose from green. Cut 2 (1-7/8” diameter) circles from pink for face. Cut slit in brim where indicated. Squeeze line of glue around edge on 1 side of 1 pink circle, leaving 1” unglued to insert pencil. Press remaining circle into glue. Referring to photo, with unglued area at bottom, glue eyes, pupils and nose in place on face. Slip bottom of hat through slit in brim and glue to secure. Glue hatband on hat. Glue yarn hair and hat in place on head. Let dry. Glue pom poms together to form spider. Let dry. To complete spider, thread needle with embrodiery floss. Take 3 stitches through larger pom pom, leaving 1” long loops on each side of body. Clip loops and trim thread to form 4 legs on each side of spider. Dot white paint on smaller pom pom for eyes. Let dry. Use toothpick to dot 1 pupil on each eye with black. Let dry. For witch, paint mouth on witch with black. Glue spider to witch’s hat. Let dry. For ghost, transfer pattern to white craft foam and cut 2 ghosts. Squeeze line of glue around edge on 1 side of 1 ghost, leaving 1” at bottom unglued to insert pencil. Press remaining ghost into glue. Glue ¼” pom pom to 1 (3/8”) pom pom to form 1 spider. Glue remaining pom poms together to form second spider. Let dry. Complete each spider as described above. Paint facial features on ghost with black. Glue spiders to ghost (see photo). Let dry. For pumpkin, transfer patterns to craft foam and cut 2 pumpkins from orange, 1 stem from green, and 2 eyes, 1 nose and 1 mouth from black. Squeeze line of glue around edge on 1 side of 1 pumpkin, leaving ¾” at bottom unglued to insert pencil. Press remaining pumpkin into glue. Glue stem, eyes, nose, and mouth in place on pumpkin. Let dry. Paint lines on stem with green. Paint lines on pumpkin with orange. Dot yellow paint on each eye for pupils.Let dry. Glue pom poms together to form spider. Let dry. Complete spider as before. Glue spider to pumpkin. Let dry.